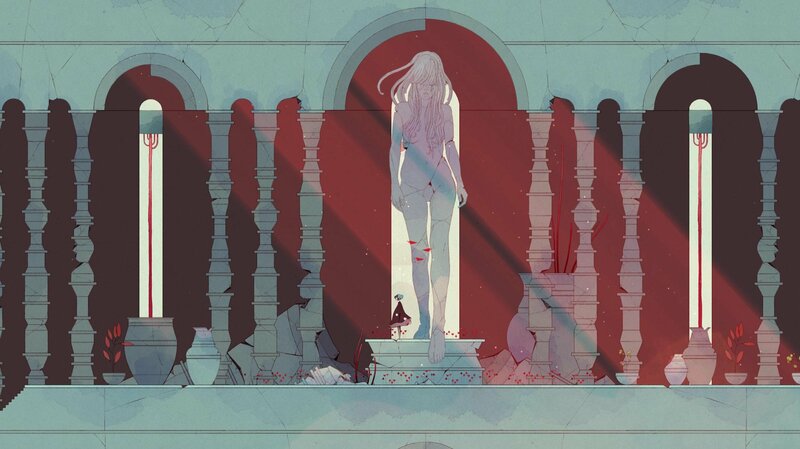 I am so torn by the huge stretch of Gris that I’ve played. Vastly more than we’d usually expect from a preview, given to us peculiarly close to its 13th December release. I’ve seen an awful lot of this enemy-less platformer, and yet I still can’t tell whether it’s beautiful enough to forgive all else, or just too dull to excuse. Gris an exquisitely beautiful game, in which far too much of your time is spent just pushing an analogue stick to the right. And let me not undersell just how beautiful. The animations in this are wondrous, balletic, often breathtaking. I’m just constantly delighted by them. Even those of the main character, Gris, which I’ve seen hundreds of times over are still a treat each time. When you stumble upon a dell of little animated creatures it’s glee-inducing. When you see a swirling cloud form itself into a creature the malevolence is deeply evocative. 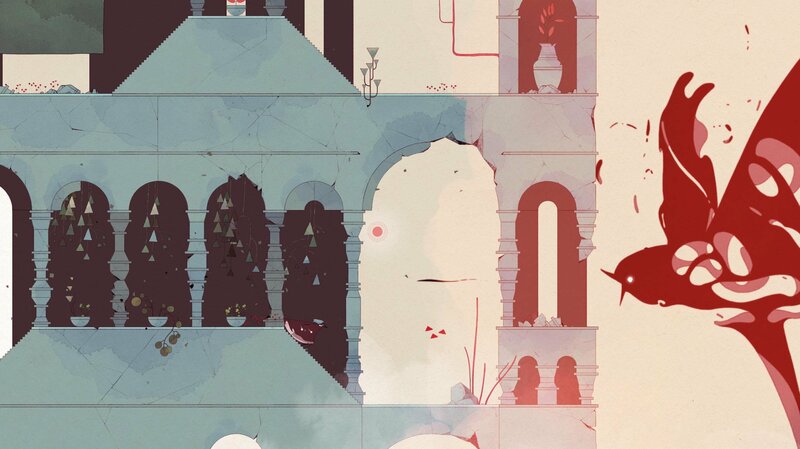 If Gris is nothing else, it is one of the most sumptuously beautiful 2D games I’ve ever played. Oftentimes as I’m playing this build a month away from release, it feels like enough. And then it makes me run inexorably to the right or left again, while almost nothing happens for an unbelievably long time, ending in its grabbing the controls away from me to do an interesting bit for itself. And I want to yell. The core of the game is about exploring an ever-expanding amount of its ever-changing world from a central hub, gathering stars to fill dotted constellations, or change seasons, or weather, or something else that’s spectacularly pretty and rewarding to watch. Along the way, extra abilities are added, giving it the air of a Metroidvania, albeit with none of the enemies. So of course there’s a double-jump, which you know from the off because there are platforms just out of reach, and of course it’ll let you swim at some point. A slightly more original ability comes in early, letting you transform Gris’s dress into a square, giving her a hefty stomp as she hits the ground. What it isn’t about is bopping beasties on the head, or swishing a sword around. While there are threats, there’s never any danger. At least in what I’ve played. For instance, a big birdy made it trickier to climb a tall building, but there was no way for Gris to die, no fail state beyond falling back to the bottom. And while it’s unquestionably deeply refreshing to see games not reliant on the constant swatting of irritants, Gris far too often feels like a game where someone modded the enemies out. It’d sure explain the huge expanses of just dull running, and agonising repetition. A substantial amount of time in, it gives you an ability to jump super-high when stood in front of small flocks of red birds. It is once more astoundingly beautiful, and the leap is another gorgeous animation. And then it has you do it again. And again. And again. And again. And then when you’ve finally reached the top of a very, very tall tower, it has you do it again. And again. And that’s the theme. 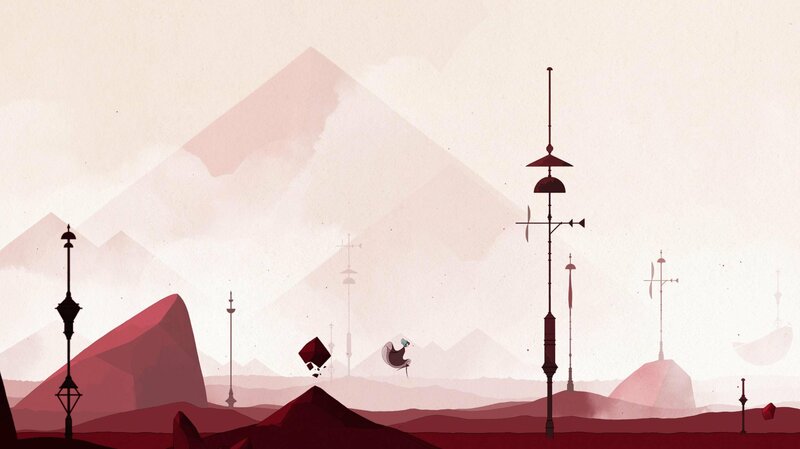 Gris is just endlessly, exceptionally beautiful. But bloody hell, it’s too often just boring. The prettiness really does counteract a huge amount of this, because just looking at the screen is extremely rewarding. Add in the superb music, and it’s undeniably an aesthetic masterpiece. But you get to do so very little. Every now and then it acts as if it’s about to blossom out into the game it could be, providing what feels as though it should be the opening of a series of platforming challenges, but then, no, you’re just running to the left or right again. In this section of the game we’ve been given, there’s a completely adorable sequence in which you’re accompanied by a shy little block creature, whom you befriend by knocking down square apples for him to eat. Together the two of you solve a couple of nice enough, if very familiar, puzzles, and it again starts to feel as though the action can match the presentation. But then nope, he’s gone, and you’re back to blandly running around again. Or having the game play for you. The ubiquity of the widescreen bars drawing in from top and bottom, every single time things have reached any sort of flow, becomes deeply dispiriting. Sometimes I don’t notice for a bit and then feel like an idiot for having waggled the controller, like a kid in a service station ‘playing’ a game while “GAME OVER” flashes on the screen. It does it occasionally to advance its loose plot, but other times it’s clearly because they were worried you might not have looked at a little scene playing out. Which is ridiculous, because watching the little animations is such a joy you’d not look away, and, well, because there’s not much else to do. However, the further I’ve played, a good few hours, the better it’s gotten. Not better enough, I really don’t think. Always falling back on corridors to run down that don’t last twice as long as they ought, but three, or four times as long, just nothingness, the spaces where the enemies feel like they could have gone if they’d suddenly changed their minds. But better. Perhaps it gets even more so, and a very slow start builds into a far more complex game? It’s impossible to know for now. One thing that seems worth adding, although it’s obviously slightly awkward. I’m… I’m kind of a bit done with games made by men that say they’re about girls dealing with traumas. Now, I’m not a complete idiot – I think games are an amazing way to explore incredibly complex issues, and have played some really excellent/upsetting/disturbing/challenging games in which creators explore personal matters like childhood abuse, eating disorders, personality disorders, and so on. I’ve been so incredibly grateful for them, learned about experiences I’ve never had, and developed a greater empathy as a result. 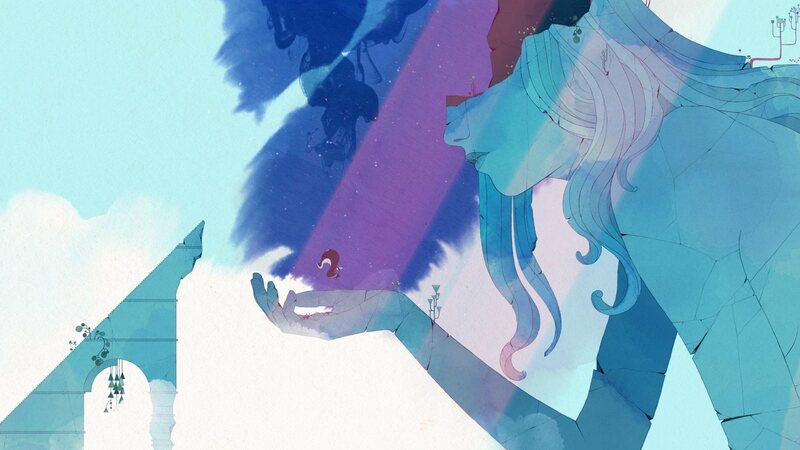 But I’ve also reached a point where seeing a game’s description written as, “Gris is a hopeful young girl lost in her own world, dealing with a painful experience in her life,” my heart hangs heavy. What makes it all the more odd is that of the large chunk I’ve played, while there are sequences that are open to interpretation about what they might represent, there’s nothing close to overtly evoking the above description. Using it at all, then, feels even more odd. I think my issue is using such matters as a shortcut for generating pathos, which is typically the shortest route to bathos. A game can earn its bond between player and character, or it can just declare that you have to have one. 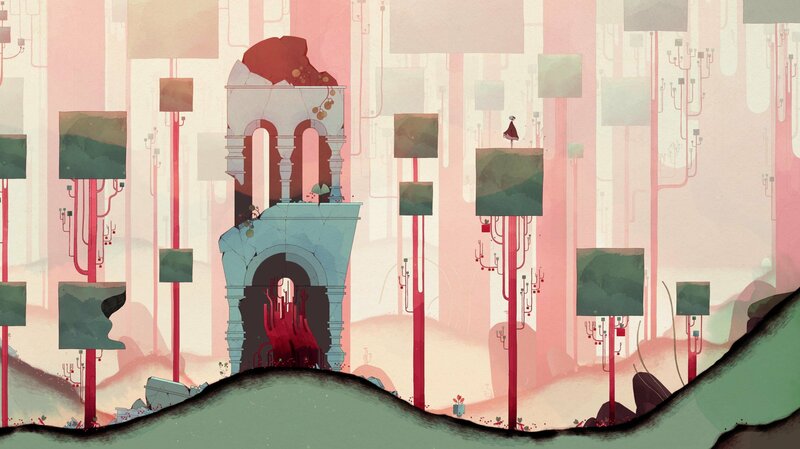 “She’s suffered because we just said so, so care!” The stupid thing here is, Gris does all it needs to do to create an openly interpretable narrative through its wonderful animations. So yeah, I don’t flipping know. It’s breathtakingly beautiful, the music is outstanding, and when it has a good idea it does it very well. And then it stops and just has me blandly run across the same landscape for four times longer than I have the patience for. It’s superb to see a platformer without enemies, but gosh I wish they’d be replaced by something instead of empty spaces. And it may well continue growing into something utterly spectacular, that I’ll beg you to plough through the early parts of to see. We’ll find out in just over a month. Tagged with Devolver Digital, feature, Nomada Studio, preview, Gris.